Because my son and daughter-in-law, Nick and Leanne, were living in New Orleans in 2002, I decided to take This Dirt Museum on the road. With their help, I connected to delightful people, hospitality, and an introduction to the city's delightful enthusiasm for the unexpected. Ever since beginning this blog, I've wanted to express my concern about the present and future of New Orleans and the Guf Coast. Up to now the website link to Common Ground Collective has been a stand-in for my wish to DO SOMETHING useful. That's a feeling shared by all Americans of good will. We wish for a more personal connection--after we've sent money for relief efforts, books to the New Orleans library. Is this urge too self-serving? It certainly is the right instinct when we see that our government's response is no-response. So much could have been different if the feds had created massive programs along the lines of the 1930s Civilian Conservation Corps to clean up and re-build. Though this elderblogger is not able to join the thousands of college students and medical professionals running a clinic who have volunteered at the Common Ground site, I hope that writing about the area reminds you to do what you can. Send money, if possible, encourage young people to participate in hands-on relief efforts. In my "Favorites" file, I keep the link to The Times Picayune, New Orleans' daily paper. 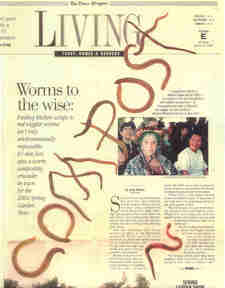 The image at the top of this page is the best piece ever written about my life with worms. It appeared April 12, 2002, as an alert about my many performances at Kingsley House, Crescent City Farmers Market, Tulane University, and the Botanical Garden. (I was younger then.) Arranging red wigglers to spell "Compost" was inspired. A readable copy is on the wall of my current installation at Knitty City. Sadly, the Times Pic, as its known, carries bad news this week. FEMA is closing the facility that housed up to 40,000 volunteers who have been giving their time and energy to re-building efforts. What can we do? Write our congressmen/women, lobby those running for national office. Wanting to end this post with some upbeat nostalgia, I offer a view of one of the objects New Orleanians particularly enjoyed. Before I plunged into kitchen composting, my art form was neckpieces crafted from weathered shells, beads, hardware. Once I discovered that wet compost could be handled like clay, would dry very hard, I had an exotic new medium--vermicompost, a/k/a, transformed garbage, to use as beads. Compost Necklace. 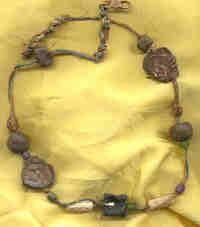 Components, starting from bottom: Manhattan compost (center square bead, note white eggshell), carved bone beads, flattened bottle caps, Mexican compost (round and small square beads), Italian glass beads, Jute cord, copper clasp.